Thai food is my favorite cuisine after Indian food. I love their curries, stir-fry's and noodles, even their simple salads. Thai food is known for its use of fresh herbs and spices making the dish burst with flavors and aroma. Common herbs include cilantro, lemongrass and Thai basil. Other flavors in Thai food come from ginger, galangal, tamarind, turmeric, garlic, shallots, peppercorn, kaffir lime and, of course, thai chilies. 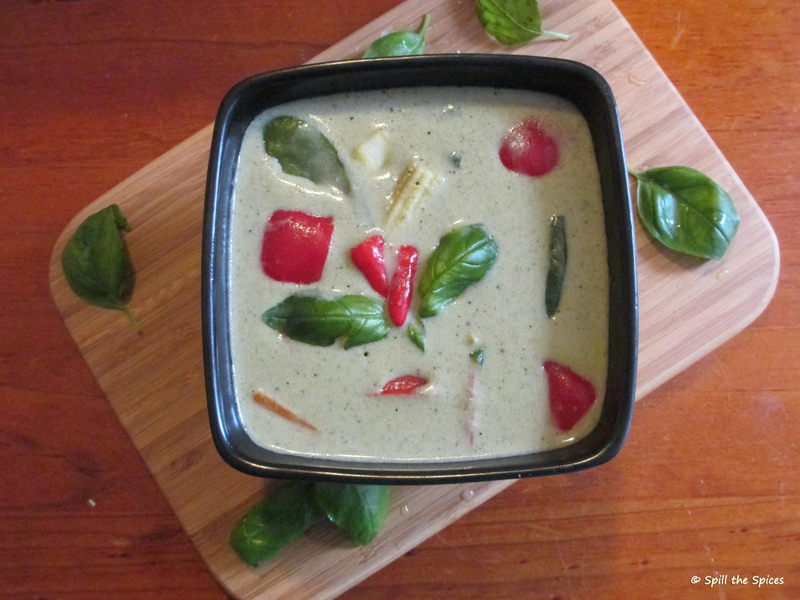 Green curry is a famous Thai curry made with coconut milk and a green curry paste. 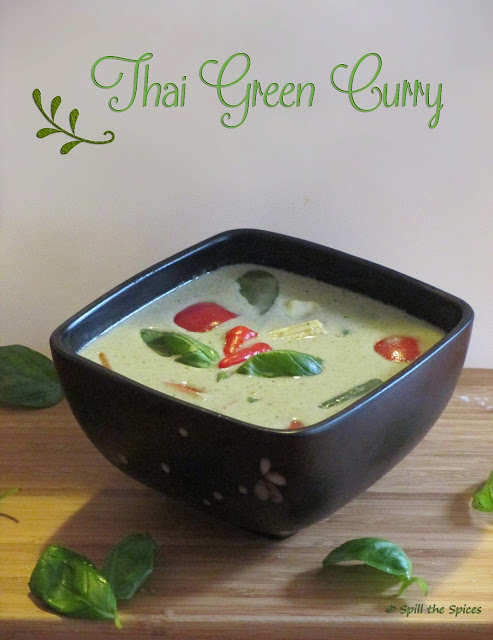 Typically the green curry paste is made by using green chillies, shallots, garlic, galangal, lemongrass, kaffir lime leaves, coriander root & leaves, roasted coriander and cumin seeds, white peppercorns, shrimp paste and salt. The sauce for the curry consists of coconut milk, green curry paste, vegetables, sugar, fish sauce and Thai basil leaves. You can add a combination of any of these vegetables for the curry: Tofu, Zucchini, Bell Peppers, French Beans, Pumpkin, Eggplant, Broccoli, Cauliflower, Babycorn, Carrot, Snowpeas etc. If you are a vegetarian like me, then you can't opt for the green curry paste available in shops as they contain shrimp paste. 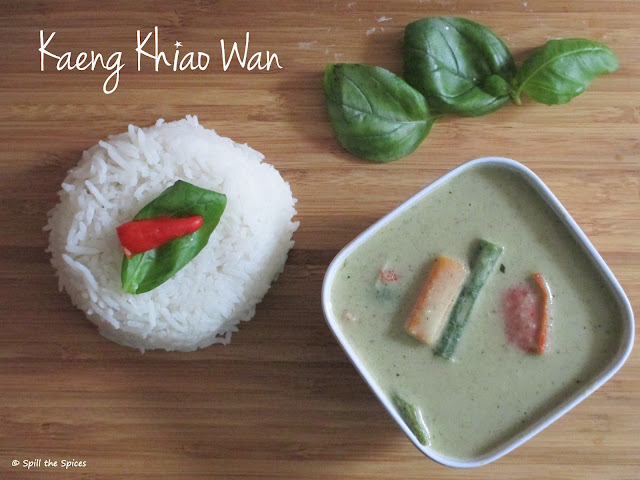 So make your own green curry paste at home from scratch. Fresh Thai basil leaves add fragrance and flavor in the curry. Serve the curry with jasmine rice. 1. Dry roast cumin and coriander seeds. Grind all ingredients for the green paste to a smooth and fine paste adding little water. 2. Steam the vegetables till they are soft but should be still crunchy. 3. Heat oil and add the paste. Fry the paste for 2-3 minutes. Then add the coconut milk and cook the paste in the coconut milk. 4. Once the paste is cooked, add the vegetables and cook for another 2-3 minutes. Add salt, sugar, soy sauce and mix well. 5. Cook for a minute and then add chopped red chillies and thai basil leaves. 1. If you don't get Kaffir lime leaves, you can substitute with lemon rinds or juice. 2. Soy sauce already contains salt, so adjust salt accordingly. Soy sauce is added as a substitute for fish sauce. 3. If you are using tofu, shallow fry them and add to the curry. lets exchange, my red curry and your green curry. i am all for that. Wow Sona the curry looks yummy..
Rich looking thai green curry. Nice pictures. Curry looks delicious, nice clicks! i love thai food..your curry looks Delicious..
this curry looks great and inviting!! Perfectly made curry. Looks delicious.